The Ranger Quad TIR Led Dash or Deck light is a 32-watt powerhouse for its size and cost. 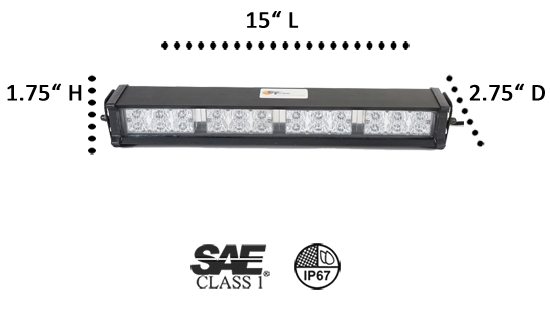 It has 4 modules each with 8 Generation III 1-Watt LEDs. This light is a favorite of the U. S. Army, police and fire departments, and other agencies around the world because its sealed, heavy-duty aluminum case keeps out moisture, sand, and dirt making it a perfect choice for off-road or desert terrains. The digital control box has an ON/OFF switch and a 26 Flash Pattern switch which can be mounted where it serves you best. Check the manufacturer's diagrams to make sure it doesn’t interfere with the deployment of airbags; the power cord plugs into the cigarette lighter or the Quad’ can be direct wired to an existing light or siren system. There are 13 solid color or split-color combinations to choose from. Look at it in action on a US Army Humvee in the Knowledge Base of our website, Customer Videos/Unique Installs. 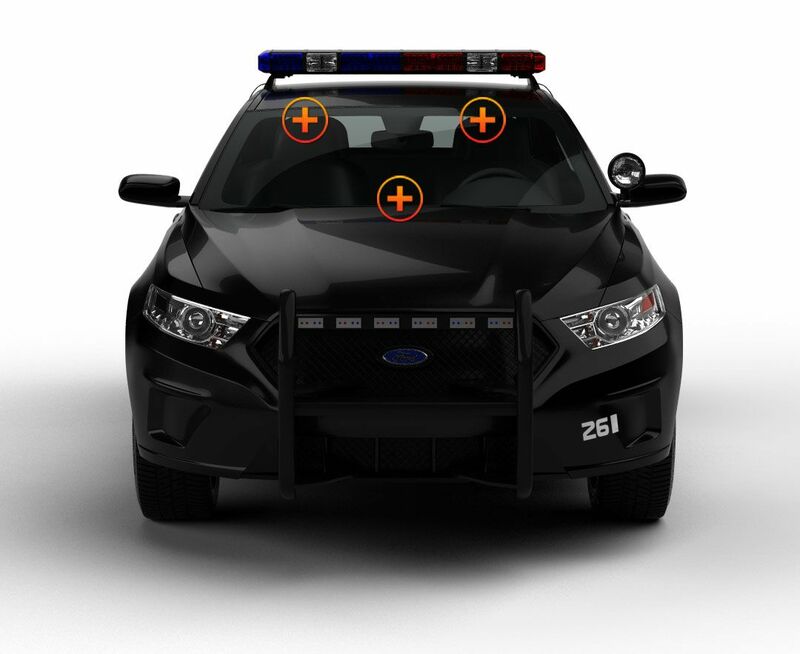 Extreme Tactical Dynamics wants you to know we’re not afraid for you to compare our emergency vehicle lighting with those of our competitors; in fact, Quality, Price, and Customer Satisfaction are our most important goals. We know how competitive our products are because we have taken extensive steps to test our Ranger Quad Light with those of our competitors. Yes, ETD gives you a whole lot of light for the buck! Just received my light kits yesterday,it was way above and beyond what I expected. Looked at a lot of sites for these lights and I am totally impressed by the quality and brightness. Definitely 10 stars. I am a Volunteer Fire Fighter and I am very happy with the results this light has given me. Very bright for it's size and has all the functions I was looking for (traffic advisor). Bought these for my storm chase vehicle for the colors amber/white. 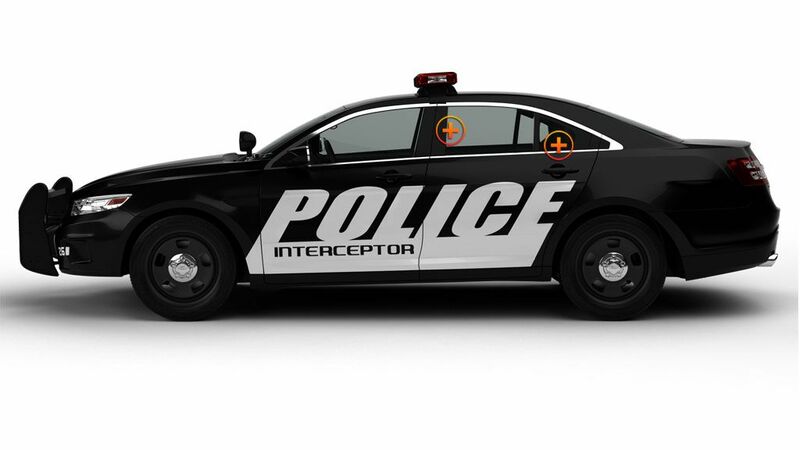 Got them installed for my back windshield. Very bright during the day. Nice price for what you get. Flash patterns are good. No problems yet. The cons is that there is no instructions in the box but it wasn't to hard to figure out how to install the brackets, common sense basically. On one of the brackets a part of it was bent but I fixed it bending it back to its normal position. I do recommend this product for those who are on a tight budget. The one good thing about this product is it comes with a car charger adapter.. I don't want to go through the hassle of drilling through my firewall in my truck and more complicated wiring. Great product. I have had other company's lights.....not even fair to try and compare! These by far are superior to any that I have tried. I wish I had found extreme first. I will be ordering more next month. Awesome light! Installed in my police cruiser which is a 07 Explorer. These lights have excellent brightness that goes right thru the window tint. Once the bad window is opened, you can hardly see because the lights are so bright. Excellent product and will continue to purchase from Extreme Tactical. Thank you! Purchased 2sets of these lights..both mounted with ease via tbe suction cup jus up behind my rearview mirrors...they dont obstruct view at all and flashback is slim to none. Extremely bright and the random pattern selector switch is perfect for hiding away along with easy hard wiring. All in all, great light cost effect and grabs attention quick. I want to start off with this light is amazing. It is extremely bright, has great flash patterns and can shine through even tint. I would spend the money again. Good job extreme tactical dynamics! These lights are amazing! They are very bright even with tinted windows! Whether during the day or night these light are highly visible! I purchased the blue/amber and installed it in my rear window. A super bright and great quality light for a great price! Has many flash patters to choose from! I would highly recommend! Thanks! Our company responds for the Office of the Chief Medical Examiner and funeral directors throughout Maryland, Pennsylvania, West Virginia, Virginia, and the District of Columbia. 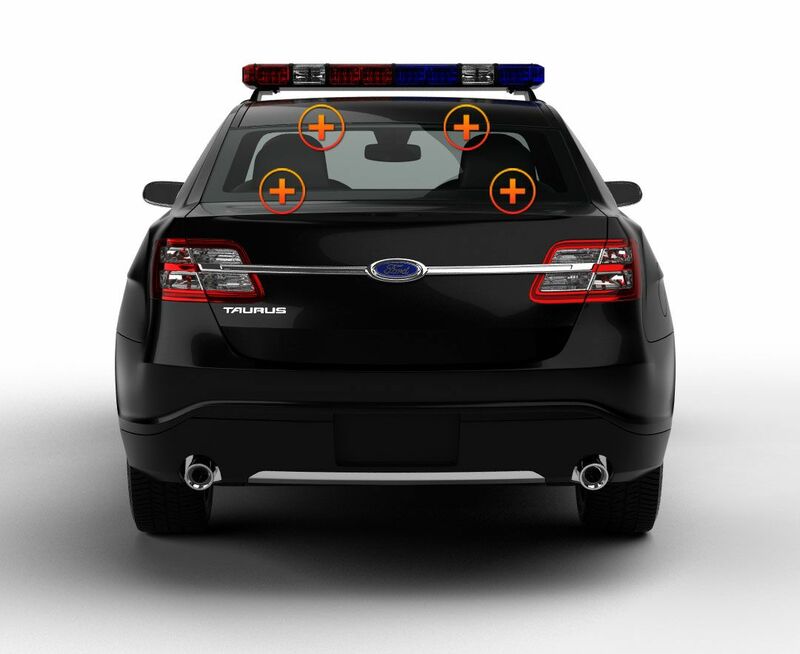 When we block one way streets to remove a deceased person from their residence or on a roadway fatality just one of these lights in the back of our Yukon or Ford Flex is all we need to keep the cars off our tail! I would recommend this light to ANY emergency responder for rear deck, interior intersection, or dash use! A bright light at a great price!! Great light. Super bright day and night. But cant seem to figure out how I mount it from the windshield to the light. The LED quad is a excellent product and suites my uses well. After I broke down on the highway I knew I needed to get something to get drivers attention, these do exactly that. The quality is outstanding, the price is great, and the brightness really outstanding. Overall these lights are great and truly get drivers attention. I ordered amber/amber and have been very satisfied with this product- it will save my life if I ever break down on i-95 in Miami again. I will be posting youtube video's of this light, as I felt there are not enough of them, to give a great preview of the product. I LOVE this light! It\'s so bright, even in the day time! The light in the picture is upside down. Lol. It is a very good light, blinding even in the day time. Great Price For A Great Light, Super Bright, Built Well and Many Patterns To Choose From. Highly Recommended Product. ordered the blue/blue for my POV. super bright in day or night, just what i was looking for.and super fast shipping.you really can not top this light for the money, its a great buy.